When it comes to finding a meal, skunks are opportunists who would rather prey on creatures much smaller than they are. While their spray is an effective self-defense measure, they aren't as well-equipped for combat and killing, so they keep it simple and target prey that doesn't pose a challenge. When that prey isn't available, they stick to a diet based on foraging. With the potent, lingering odor of their spray, skunks may seem like a nuisance to humans. These creatures are actually beneficial to humans, though, because they frequently prey on creatures that are harmful. Pests like snakes, scorpions, cockroaches and even deadly black widow spiders are all on the menu for skunks, as well as rodents like mice. According to the Evergreen Animal Protective League, the majority of a skunk's diet -- about 70 percent -- is made of insects that are harmful to people. While most of the skunk diet is insect-based, these animals may also devour small, relatively helpless animal prey, as well. Field mice, voles and rabbits may all be targeted by skunks, as well as ground-nesting birds. 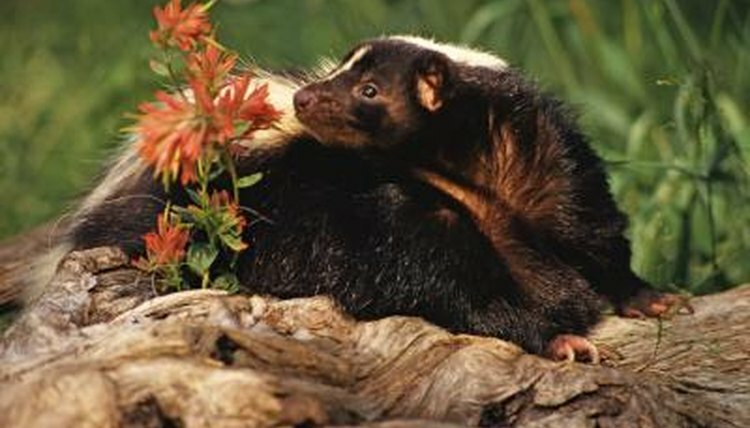 Skunks may even eat the eggs or flightless young of ground-nesting birds. Other small, defenseless prey may include fish, reptiles and amphibians like frogs. Though skunks prefer a diet of animal matter, their usual food sources are not as plentiful in fall and winter as they are in spring and summer. During colder months, skunks still eat whatever insects and small prey they can find, but nonetheless adapt to a plant-based diet. They forage for plant life like corn, cherries, grapes and berries, whether or not they are fresh. Skunks prefer food that has already fallen to the ground, making it more accessible, and consequently eat rotting fruits and other crops that humans would not harvest anyway. Skunks are not picky eaters, and they take what they can get -- including garbage left unattended by humans. A refuse bin is home to many staples of the skunk diet, like rodents, insects and rotting food, and skunks will unscrupulously rummage through an open garbage can or dumpster in search of a meal. They may also look for food in compost piles, bird feeders and outdoor grills, leading them into conflict with humans and their pets.